I bought this device after researching the NEBOX from Kanger. I used my own money. What I am relaying here are my own opinions. THIS is the box that Kanger should have released instead of the NEBOX. I know that A LOT of people love the NEBOX. Believe me, I heard the responses loud and clear. And, folks probably know, by now, that I never had an NEBOX, do not plan on having an NEBOX, and have some rather strong feelings about any devices that try to lock vapers into THEIR proprietary products. Where Kanger is telling you to use only their coils, this device allows for the use of any 22 mm tank. This, of course, means that the tank isn’t going to be plastic unless the vaper wants it to be plastic. Glass tanks can be used, and the tank is well protected. That also means that the coil options are vastly superior. Where Kanger only supplies 60 Watts, this device delivers 75 Watts. 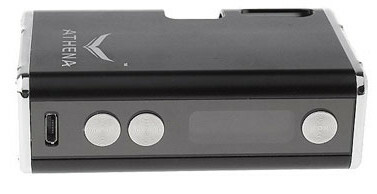 Where Kanger was charging anywhere from $50 to $80 for the device, this one can be found for around $40. Yeah, the tank does not come with it, so there's an additional cost. 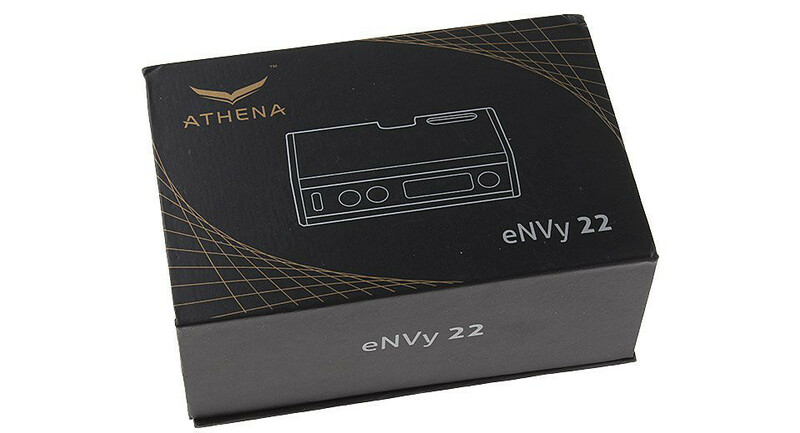 However, that's mostly offset by the inclusion of a 3200 mAh battery in the Athena eNVy 22, and the need to purchase at least one 18650 for the NEBOX. I'll say it again because I want to be clear: This is the box Kanger should have made. How much is it, and where can it be purchased? I’ve seen it as low as $39.99 at eFun.top. I paid $43.67 after a coupon at FastTech. It's now $45.60. In the states, I’ve seen it online at Vapes.com for $74.95. There is also the Beyond Vape Tandem 75 for $85. The packaging is pretty standard. It's black with silver/gold lettering and flourishes, and a magnetic front flap that hinges open to reveal the inside. The top features a line drawing of the device, the companies logo, and the device's name. The front - the magnetic flap - has the device's name and the scratch-n-sniff sticker. The back again has the device's name and the color indicated by a checkmark sticker placed in a circle above the corresponding color chip. Although the website says it's available in black, silver, brown, red, and blue, and I've seen it on most sites in black silver and blue, the color chips on the box are gold, brown, dark brown (maybe black), and silver. The bottom is covered with warnings, logos, QR codes, the "standard configuration," "parameters," and certifications. Once opened, the packaging remains pretty recognizable. The foam insert with the mod (in a filmy plastic bag), and, under the insert, a lift up tab for an area containing a USB cable, a tiny manual in English and French, a plastic VIP card like those that ship with Cloupor units nowadays, and a warranty card. screen, the unmarked, but logically placed, milled metal up and down buttons, and a micro USB charging port all set in a black plastic strip. When the screen is off, it's hard to see where it is. When fired up, though, the screen is fairly easy to read, and chock full of information. The OLED screen is divided lengthwise into two section. 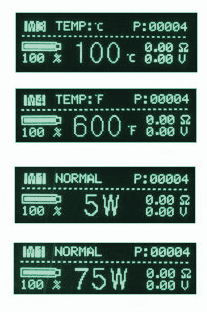 On the top section the display will read "M1 NORMAL," "M2 BYPASS," "M3 TEMP: C," or "M4 TEMP: F." On the other end of that top section is a puff counter. "P: 00905" is what my device currently reads. On the other side of a dividing line, things start to look a little more familiar. At the top is a battery bar with the percentage of charge helpfully displayed beneath, then the current wattage, temperature, or voltage depending on mode, and finally, the resistance is displayed over the applied voltage. Opposite the control area, under that 23(ish) mm hole, is the cage that the tank sits in. The depth of the cage, down to the spring-loaded 510 connector, is about 45 mm. I couldn't actually measure the depth, but my UD Bellus fit in there and is flush with the top of the device. The UD Bellus is 45 mm tall. I call it a cage, and it is. The cage is separated into two sections, top and bottom. On top, there is a rounded, wrap around with three long oval cutouts. Underneath that, it is open. I keep saying that the hole is 23(ish) mm in diameter. The device will take any 22 mm tank, and leave a little room for air. If the tank bells out like the Kayfun V4 or Billow V2, it will not fit. If the tank has outsized knurling like the UWell Crown, it will not fit. If the tank is actually 23 mm like the Lemo, it will not fit. When attaching a tank, screw it in rather loosely. I screw mine in with the drip tip (which is rather snug) and if the drip tip starts to turn instead of the tank, I feel like it's tight enough. I take the tank out by starting it with my fingers, and then unscrewing it with the drip tip. Really tightening down the tank can cause issues when removing the tank later. I purchased this device in a deep brown color - almost looks deep purple in the right lighting, but it looks stellar with one of my dark wood drip tips. I've only found it available online in silver, black and blue. The blue is not Tiffany blue, praise be! It's closer to the iStick blue. Safety features: Overcharge protection, High Temperature protection (for the chip), Short-circuit and low-voltage protection, 10 second cutoff. Five clicks to power on and five clicks to power off. Mode 1 is power mode - wattege. Says "NORMAL"
Mode 2 is bypass mode - direct voltage from the battery - mech mode. Says "BYPASS"
When in menu mode, press up and down simultaneously to reset the puff counter. Click the fire button to exit. When powered on, pressing the up and down button simultaneously for a couple seconds flips the screen. When powered off, pressing the up and down buttons simultaneously provides the version number and the mods born on date. Pressing the up and power button at the same time will flip the screen. When using the device, the up and down buttons act as they should. Pressing the up or down buttons increases or decreases the wattage in 1 watt increments, the temperature in C in 5 degree increments from 100 to 300, and the temperature in F in 10 degree increments from 200 to 600. Pressing and holding either button for 2 seconds engages an auto accelerator which can only be stopped by pressing the opposite button. The accelerator is speedy (and why not with 1 watt increments), and the wattage cannot be locked. In bypass mode, the up and down buttons do nothing. The fire button either fires the device, powers it on, powers it off, or enters the menu. All of the buttons are somewhat clicky with very short throws. Unfortunately, for those that check such things, the buttons do rattle a very little bit. For charging, simply plug in a micro USB cable and use a 5V/1A wall wart. The device goes from empty to full in about 3 hours... maybe a bit more... It's nice, though, not having to lay the device over to get to the charge port. The manual states quite specifically that the device should not be used while charging. I have run this device with my UD Bellus fitted with a .37 Ohm build at 43 Watts and 3.99 Volts and in Bypass mode, with a Kanger Subtank Mini with a .15 Ni200 coil in TC mode, and with an Erlkonigen built to .2 Ohms with Ni200. I've had no problems whatsoever. The battery life is pretty phenomenal. On a recent 5 day trip, I used two mods (the previously reviewed Esige Eiffel T1), and never had to charge either one. 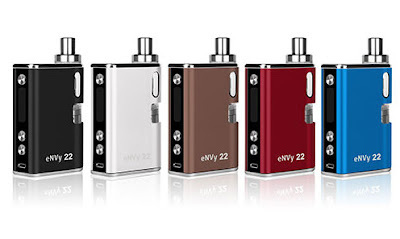 The eNVy 22 was in TC mode with the Erlkonigen attached and I went through 14 ml (2 tanks) of e-liquid. It's interesting to note that this device caught more than my eye. 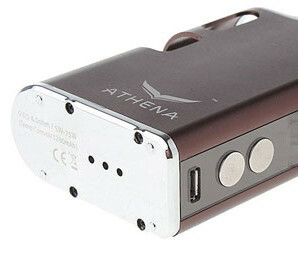 Beyond Vape teamed up with Athena to have a version made just for them. It's been branded as the Tandem 75. As I understand it (but cannot confirm it), their model features some additional refinements such as .1 increments in wattage... Beyond Vape also has a 45 mm extension that can be purchased allowing the device to be used with an RDA (or a tank larger than 23 mm in diameter). How cool is that? 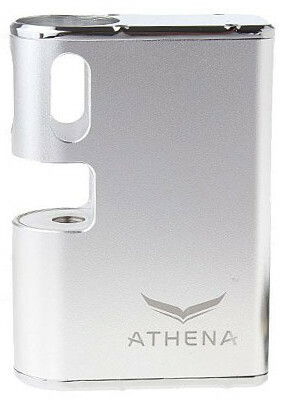 Finally, the manual says that the device can be upgraded, but at this time, Athena's website has no packages to download and no instructions for updating the device. Finish - 10/10 - I can find no flaws with the way this device is put together. The attention to detail really shines through from the silky smooth threads in the 510 to the wee little nubbins on the bottom to protect the mod from scuffs. Form - 9/10 - The device is comfortable to hold, but the grip has to be adjusted from time to time to avoid covering the air holes on the tank. Fortunately, the oval cutouts give a cue to where to place your fingers. Function - 8/10 - Although the device functions exactly as it should, I would really like to see some additional wire types added to the TC modes or TCR adjustments. With the accelerator being auto, and there being no wattage lock, it's too easy to accidentally step your wattage way up (75 Watts) or way down (5 Watts). I can, without hesitation, recommend this product. I would seriously consider replacing it if it became damaged or lost. 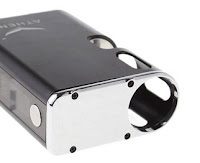 Hi, great review and even greater mod.But not perfect.The thing is a lump,but one with a great battery ,four times that of my Nebox.Feels bullet proof too.I got over 40 hours of use at medium to heavy vaping b4 it needed recharging,perfect for work.Its my carry mod now and I think the Nebox will be heading to E Bay.I would prefer a more prominent fire button lockable settings and it to be curved both sides,like the Nebox ,just little niggles.If anything happened to it I would replace without hesitation, if another or a 17 comes up on E Bay my name is on it.Highly recommended,thanks for the pointer.